Industrial News Features Cheers to 40 Years! Wildeck and Wisconsin share a history that dates back to the mid 1940s. The company can trace its roots back to Williams Steel and Supply Company, a high quality steel service center that was founded by Herman Williams in Milwaukee in 1944. One of the products Williams manufactured were custom designed industrial steel work platforms, which were known as “Wildeck® Mezzanines.” Over time, the Wildeck® Mezzanines continued to grow in popularity with customers looking for extra space in their existing facilities. 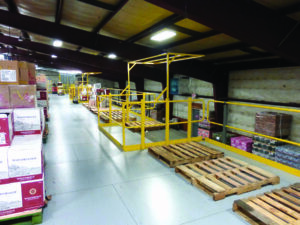 These mezzanine platforms were accounting for such a large part of Williams’ business that the Wildeck Mezzanines division was eventually formed in 1976. Seven years later Wildeck officially incorporated and became Wildeck, Inc. – and we’ve never looked back. 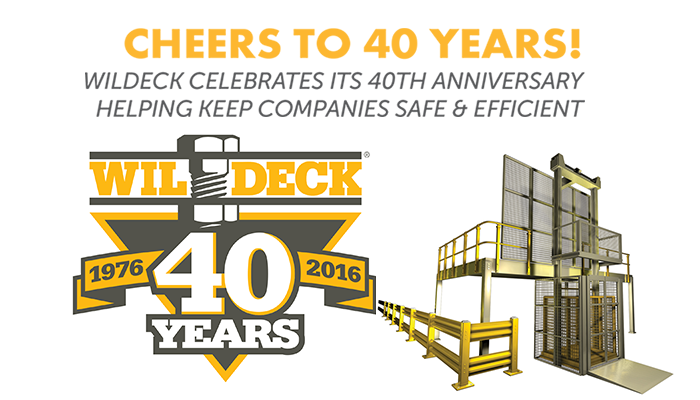 This year marks Wildeck’s 40th year in business, and we don’t intend to slow down any time soon. 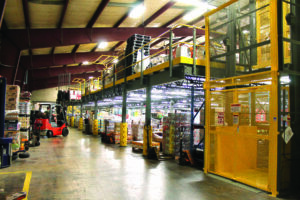 Not only are our mezzanine platforms, vertical reciprocating conveyors (VRCs) and guarding products still all American-made, but we take great pride in knowing that they’re contributing to better, more efficient operations while making working conditions safer for employees and more effectively protecting equipment in companies around the world. Our 100,000 square-foot facility boasts precision computer-controlled machinery, including state-of-the-art 600-ton brake press, fully automated paint line and robotic welding. We’re also just completing a building renovation and remodeling project at our Waukesha headquarters, and we’re expecting to create more jobs in the coming years. Wildeck also owns Ladder Industries, a Goodyear, Arizona, based manufacturer of custom designed industrial ladders, equipment platforms, conveyor crossovers, and other access products. Today, Wildeck is a subsidiary of Holden Industries, and is a 100 percent employee-owned ESOP company. Our pride of ownership is reflected in the quality of our products, our dedication to innovation, customer service and safety; after all, a major part of our business is helping companies protect personnel, assets and machinery. 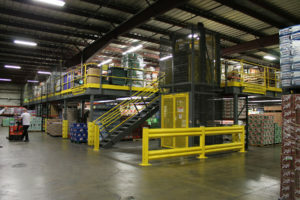 Though we pride ourselves on innovative products like the EdgeAlert™ Open Gate Alarm System for mezzanines and loading docks, our engineers have also put their design skills to work to improve on a more basic—but essential—safety product: protective guard rail. With no OSHA guidelines outlining its use, protective guard rail is something that’s often overlooked. Many facility managers don’t realize how essential it is for protecting equipment, assets and personnel until it’s too late. Protective guard rail is also a relatively inexpensive investment, but proves its worth by protecting your people. OSHA estimates that forklift accidents are responsible for roughly 85 fatalities and 35,000 serious injuries each year. Properly installed guard rail could have prevented many of these accidents by keeping vehicles out of hazardous or off-limits areas—something even the brightest yellow tape can never do. But it’s important to make sure the guard rail you choose can take the hit. Although guard rail options may look similar in appearance, they’re not all made the same. If a manufacturer hasn’t listed their products’ impact ratings, avoid it. It has either never been tested, or failed, an impact test. A loaded forklift generally weighs between 8,000–10,000 pounds, so many guard rail systems are built to withstand a 10,000-pound impact traveling at 4 mph. At Wildeck, we went beyond that, manufacturing our top of the line Wilgard® XT to be extra-tough. It is the highest-quality industrial guard rail on the market, with an impact rating of 13,000 pounds traveling at 4 mph, while maintaining a safe zone of 10 inches after impact. We use corrugated 11-gauge steel for the rails, increasing strength and safety by hemming and smoothing out the top and bottom edges. Many manufacturers skip this step, simply covering rough edges with plastic strips that can eventually easily fall off. We also added strength by using 5” x 5” column posts (instead of the more common 4” x 4”) and 12” x 12” base plates. Instead of bolting rails to the front of the post, exposing jagged edges, we bolt them to the inside. Wilgard® XT (XTra Tough): Tested for 13,000-pound impact traveling at 4 mph. 10” safe zone behind rails; recommended for applications involving heavy fork truck traffic. Wilgard® MT (Medium Toughness): Tested for 10,000 pound impact traveling at 4 mph. 11” safe zone; positioned to compete against other medium grade guard rail at a competitive price. Wilgard® LT (Lighter Toughness): Ideal for light-duty guarding of work areas and walkways, finished goods staging areas and other similar applications; provides high value at a lower price point. Companies big and small look to Wildeck for their safety solutions. For example, Precision Gears in neighboring Pewaukee, Wisconsin, selected our Wilgard® XT guard rail and EdgeGard™ dock gates to upgrade the safety of its loading dock. Wildeck’s range of products was able to provide complete safety coverage for multiple doors and access points on the company’s horseshoe-shaped dock. Over in New England, American Plumbing & Heating of Norwell, Massachusetts, was the first company to incorporate Wildeck’s patent-pending EdgeAlert™ Open Gate Alarm on the two sliding gates that provide access to their new 4,284 square-foot Wildeck® mezzanine platform. Wildeck is an American company and we take great pride in the strides we’ve made in the past 40 years to help make companies operate in a safer and efficient manner. Hubert (Hue) Schlegel is the director of marketing at Wildeck, Inc. (www.wildeck.com). He can be reached at 262-549-4000; hschlegel@wildeck.com.